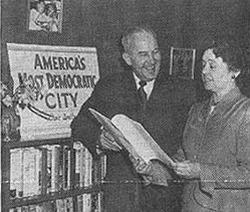 Seattle Mayor William F. Devin with Civic Unity Committee Executive Secretary Louise Blackman, 1950. The Seattle Civic Unity Committee was formed by Seattle Mayor William F. Devin in 1944 in response to rising racial tension in the city. During World War II Seattle, like other west coast cities, received an influx of African Americans raising its black population from 3,789 in 1940 to over 10,000 in 1943. It also received thousands of other white residents, many of whom were from the South. As black and white newcomers mixed uneasily with the older established white, black, and Asian populations in war production facilities, such as the Boeing Airplane factories and in local shipyards, racial tensions rose. As Seattle’s wartime population increased so did indications of racial separation and discrimination especially between blacks and whites. For the first time there were signs being put in restaurants, movie theaters, and motels that said “Whites Only,” indicating that African Americans were not welcomed. There were also numerous small incidents–usually clashes between whites and blacks in the workplace, on city buses, and in theaters and department stores. Discriminatory housing and hotel practices and even racist cartoons in local newspapers also increased tensions. Mayor Devin, recognizing this problem, created the Seattle Civic Unity Committee (CUC) in February 1944. The Committee’s primary focus was to try to dampen this tension and thus reduce the possibility of racial violence. The CUC was modeled after similar groups in Detroit and New York, which had already experienced wartime race riots. It was composed of a cross section of prominent white Seattle citizens including a University of Washington educator, an industrialist, a Protestant clergyman, two women active in community work, and two organized labor representatives. The committee also included one Chinese American member and two African American members. By its existence, the CUC recognized that there was racial tension in the city and encouraged groups to discuss differences. It also made radio broadcasts on interracial issues, promoted awareness-raising programs on racism, and published a monthly newsletter called Fair Play which celebrated constructive civic events dealing with race. The Committee also made recommendations to the mayor on issues involving race. In July 1944, five months after the founding of the Seattle Civic Unity Committee, Mayor Devin gave a major speech at the University of Washington where he for the first time openly addressed the problem of racial tension in the city. His speech was made at the request of the Civic Unity Committee. After World War II ended the Civic Unity Committee centered its attention on housing and educational opportunities for minorities. It also worked with local civil rights organizations such as the National Association for the Advancement of Colored People (NAACP) and the Seattle Urban League. When the Washington State Board Against Discrimination (WSBAD) was created in 1949, the CUC supported its efforts. The Seattle Civic Unity Committee dissolved in 1964, its role supplanted by the active civil rights movement then ongoing in the city. Many of its members joined the NAACP, the Urban League, and the newly formed Congress of Racial Equality (CORE).